Hoodia gordonii looks like a cactus, but it's actually a succulent from the Kalahari Desert in southern Africa. Bushmen from the area have been using hoodia for centuries to help ward off hunger during long trips in the desert. Hoodia gordonii is entirely natural -- it is not a drug. Pharmaceutical companies find it so promising, however, that they are trying to isolate the appetite-suppressing molecule, P57, to create a patented diet drug in the future. Only the gordonii variation of hoodia has appetite suppressant abilities. Hoodia tricks the brain into thinking you've eaten, and makes you feel full. Hoodia may work right away, or may take several weeks. 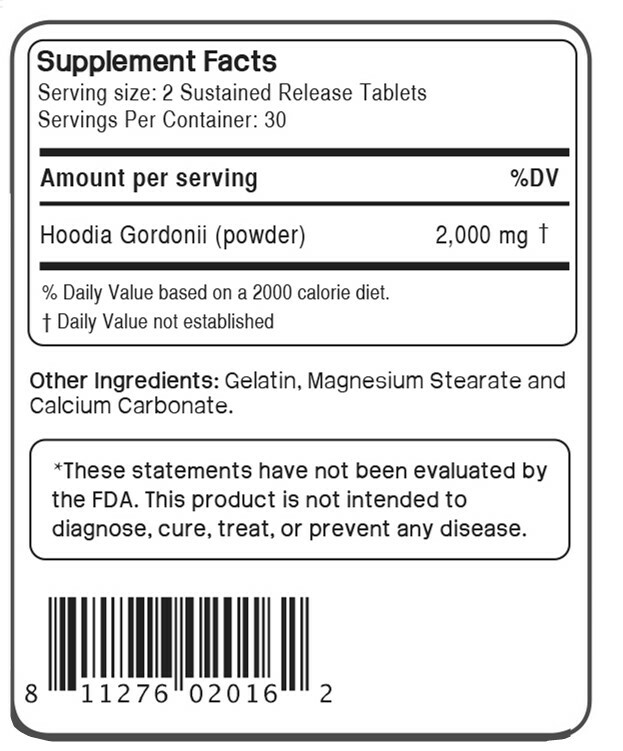 Hoodia gordonii is not a stimulant, and has no known side effects. Hoodia appears to be safe for most people. Directions: Take one (1) table two times daily as a dietary supplement. For best results, take early morning, and early evening, with 8 ounces of water or as directed by a healthcare professional. This product should be used in conjunction with a sensible diet and exercise program. Do not exceed three (3) tablets daily. • have anorexia, bulimia or any other eating disorder.